This trampoline is pure fun! 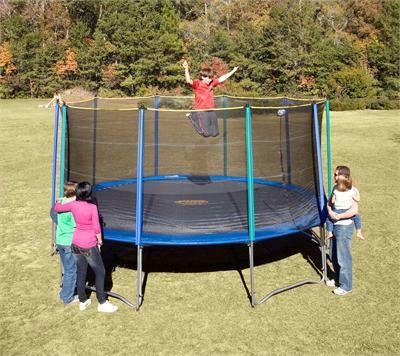 Families will love the 15 ft Pure Fun Trampoline. They'll get exercise without even realizing it while testing and perfection their jumping skills leaping higher and higher with each bounce. Parents can rest easy between the enclosure keeping children safely on the mat and the Pure Fun logo leading them back to the center of the trampoline, giving them the biggest leaps and the most safety. 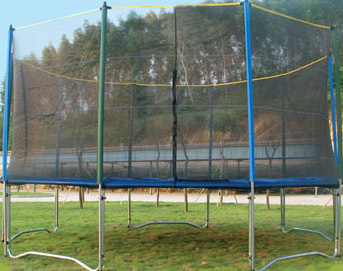 Trampoline and Enclosure Sets are easy to assemble with the included patented assembly tool. Our trampolines and enclosures come with a 2 year limited warranty and are ASTM approved, TUV and GS quality and safety certified. The trampolines feature patented no-weld T-section construction, galvanized iron steel tubing, rust resistant frame and W-shape legs for added stability. The polypro jump pad is made in the USA with 8 rows of stitching and thick foam padding with vinyl covering over the extra heavy duty galvanized steel springs. The enclosures are made from UV resistant mesh fabric with elastic net straps sewn in and feature an easy entry zipper enclosure. Steel clamp connectors are included for leg poles (poles include protective plastic top caps).